Wu Yuan, a 59-year-old volunteer, kneeled down on the playground of a primary school in Myitkyina, Myanmar, and kowtowed for three times with tears running down his face. "Before he died, my father asked me to bring my uncle's remains back and finally I came here," Wu told The Beijing News. Wu's father used to be a Kuomintang military officer. His uncle Wu Qizhang was the commander of an infantry troop of the Chinese Expeditionary Force (CEF). Wu Qizhang died in Myanmar in December 1944 and was buried under the ground now growing with wild grass. 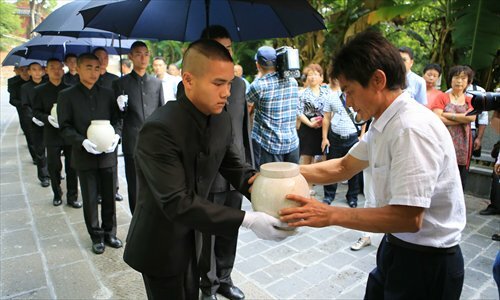 Wu Yuan's mission is to bring his uncle's remains home and bury him near his grandparents' cemeteries. The CEF was established in 1942 to support UK troops against Japanese fascism and safeguard China's southwest regions during World War II. Some 100,000 CEF soldiers died in Myanmar, according to The Beijing News. Compared to dead soldiers of the UK and Japan, who rest in grand graveyards and were treated with high respect, most graveyards of Chinese soldiers have been destroyed. Considering the difficulties in re-establishing Chinese soldiers' cemeteries in Myanmar, some civil societies began to seek a new way to commemorate their martyrs: bring their remains back. Sun Chunlong, head of Shenzhen Longyue Charity Foundation , is dedicated to the project of seeking and bringing remains of CEF soldiers back to China. Sun told the Global Times that the project was inspired by a tour in 2011, when he found that most graveyards of Chinese CEF troops in Myanmar had been destroyed and he could only discover a broken tombstone of one soldier in Bhamo. He said that without the guidance of local overseas Chinese, he could not identify any traces of the graveyards and there was no place for him "to worship those martyrs." However, Sun found three well-preserved graveyards for UK soldiers, with the biggest one containing 6,347 tombs. "Black tombstones were on the green grass as if they were standing in a phalanx on the battlefield," Sun wrote in his book Yiyu 1945. "It is like they have never died." Ge Shuya, a history professor at Yunnan Normal University in Kunming, told the Global Times that since 2001, he has visited Myanmar several times to search for the graves of Chinese veterans in hopes of transferring their remains home. According to him, about 15 graveyards of Chinese CEF soldiers could be confirmed in Myanmar, where at least 3,000 soldiers were buried. Most graveyards could not be traced, while some were replaced with residential communities, schools and temples. "As a victorious nation, our tombs were run-down. However, as a defeated nation, the Japanese tombs have been well preserved," Ge said, adding that a large number of graveyards were destroyed during 1950s and 1960s, when Myanmar military was defeated by Kuomintang troops, motivating local residents to seek revenge by destroying these cemeteries. According to Ge, the Yunnan Returned Overseas Chinese Federation has been devoted to re-establishing graveyards and building monuments in Myanmar. However, their campaigns were ineffective as it is difficult to get approval from Myanmar authorities or reach agreements with local temples. Bringing remains back is another way to commemorate martyrs and should be supported, said Ge. Liu Yaxin of the Shenzhen Longyue Charity Foundation said that their excavation team, led by archaeologists from Shaanxi-based Northwest University, has successfully uncovered 267 remains as well as items like army boots and helmets. According to Liu, the foundation raised funds from large-scale enterprises and private donations and plans to invest more than 2 million yuan ($322,600) in a first round of projects that are scheduled to conclude in July. "Currently the unearthed remains have been stored in a cemetery for Chinese nationals in Myanmar, and we are looking for places to build new graveyards for the returned martyrs," she said, adding that after bringing soldiers' remains back, the foundation will also conduct DNA tests on every corpse and build up a database for further identification of their families. However, Liu admitted that the project ran into many problems. "Some remains were buried under large buildings, which needs further negotiation, while some were poorly preserved, making it hard to do a DNA test," Liu told the Global Times. Sun said that the most difficult part is to communicate with the Myanmar government and residents whose houses were built above the graveyards. He said that he needs to build new houses, playgrounds and school supplies to earn their trust and carry out excavations. It is not the first time Chinese martyrs' remains have been retrieved from Myanmar. In September 2011, the remains of 19 Chinese veterans were recovered by the Yunnan Alumni Association of the Huangpu Military Academy and the Yunnan Returned Overseas Chinese Federation. They were transferred to the Guoshang Cemetery that was founded in 1945 in Tengchong county, Yunnan. Ge noted that due to some historical reasons, the main task of bringing back the remains falls on civil society, including overseas Chinese federations and other NGOs. Protecting the remains of Chinese veterans in foreign countries involves diplomacy, which makes things more complicated, said Ge, adding that a lack of communication with the Myanmar government may lead to risks to Sun's project. Ge also pointed out that unprofessional excavation by some groups also caused a lot of problems, such as the loss of remains. "Previously, dozens of remains went missing during excavations," he said. Responding to appeals from citizens and experts, the Ministry of Civil Affairs, the Ministry of Foreign Affairs and other departments in 2011 joined in hands to protect the tombs of overseas martyrs. This is reportedly the first time that the Chinese mainland has launched efforts to protect foreign cemeteries. Protecting the remains is related to a nation's dignity and honor, said Sun. "We hope to bring all remains back, no matter how long it will take."